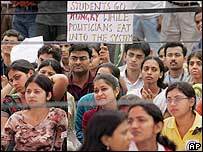 The Indian government has decided to implement a controversial affirmative action plan despite ongoing protests. Under the plan, half of state-funded professional college places would go to lower caste students. After a meeting which ended late on Tuesday night, the Congress-led Indian government announced that a bill would be introduced in parliament. The plan will come into effect in 2007. Those opposed to it say it will lead to a drop in college standards. At present, 22.5% of college places are "reserved" for Dalits, or untouchables, who are at the bottom of India's caste hierarchy, and tribal students. Under the new plan, 27% of places will also be set aside for lower caste Hindus known as other backward castes (OBCs) and other socially disadvantaged groups. "The percentage of reservation for OBCs will be fixed at 27%," Defence Pranab Mukherjee told reporters after a three-hour meeting between the government and its allies. "Legislation for this purpose will be brought in parliament in the monsoon session." However, the move has drawn fire from medical students as well as business leaders and teachers who say it will lead to a drop in standards. Doctors and medical staff at state-run hospitals have been on strike for nearly two weeks, affecting medical services in the capital Delhi and other Indian cities. But the plan has the support of millions of low-caste Indians who make up more than 50% of the country. Despite laws banning discrimination, India's lower castes remain at the bottom of society and are poorly represented in major professions.